Destruction of "New Jerusalem," 1775. Capital of the Russo-Polish government of the same name, and former capital of the kingdom of Poland; situated on the left bank of the Vistula. According to Polish writers, the earliest settlement of Jews in Warsaw dates from the thirteenth century, and their influence at that time is indicated by a number of documents in Hebrew script preserved in the local archives. They at first resided on the Jewish street near the present Dunai street, whence they spread to other quarters of the city, acquiring houses and lands, possessing a cemetery, and owning a synagogue near St. John's Church. (1) No Jew, Jewess, Jewish child or servant (be the latter Jewish or Christian) shall dwell with property or wares on any lands, municipal, royal, or clerical, within the limits of Old Warsaw or New Warsaw, nor may he or she remain there even during royal sojourns, excepting only at the time of the Diets, when Jews shall be permitted to visit Warsaw for business purposes. (2) The Jews who have business connections in Warsaw shall be allowed to sojourn there with the written consent of the magistrate; but they shall not have the right to engage in any trade or handicraft which may in any way interfere with the daily pursuits of the citizens. (3) The Jews shall have no right to reside on any grounds, or to trade or ply their handicrafts, within a radius of two miles from Warsaw on either bank of the Vistula, under penalty of confiscation. (4) It shall be the duty of the magistrates and their successors at Warsaw to enforce the removal of the Jews from the city and its environs without regard to any extenuating circumstances or even to letters of exemption from the king or his successors. 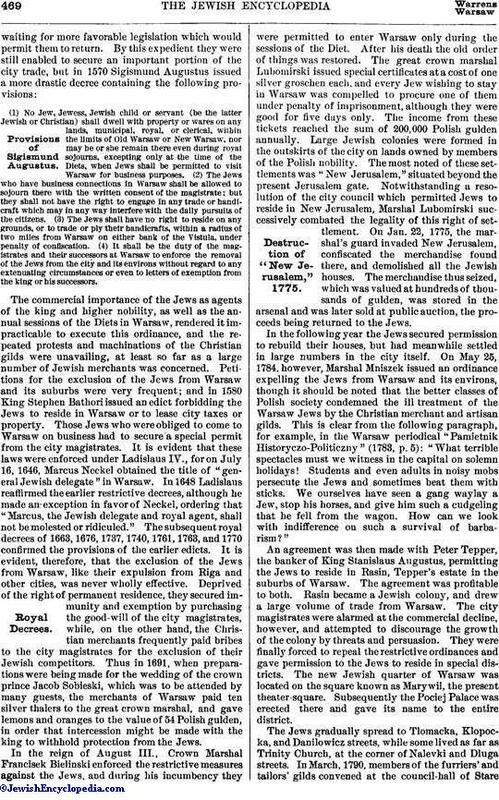 The commercial importance of the Jews as agents of the king and higher nobility, as well as the annual sessions of the Diets in Warsaw, rendered it impracticable to execute this ordinance, and the repeated protests and machinations of the Christian gilds were unavailing, at least so far as a large number of Jewish merchants was concerned. Petitions for the exclusion of the Jews from Warsaw and its suburbs were very frequent; and in 1580 King Stephen Bathori issued an edict forbidding the Jews to reside in Warsaw or to lease city taxes or property. Those Jews who were obliged to come to Warsaw on business had to secure a special permit from the city magistrates. It is evident that these laws were enforced under Ladislaus IV., for on July 16, 1646, Marcus Neckel obtained the title of "general Jewish delegate" in Warsaw. In 1648 Ladislaus reaffirmed the earlier restrictive decrees, although he made an exception in favor of Neckel, ordering that "Marcus, the Jewish delegate and royal agent, shall not be molested or ridiculed." The subsequent royal decrees of 1663, 1676, 1737, 1740, 1761, 1763, and 1770 confirmed the provisions of the earlier edicts. It is evident, therefore, that the exclusion of the Jews from Warsaw, like their expulsion from Riga and other cities, was never wholly effective. Deprived of the right of permanent residence, they secured immunity and exemption by purchasing the good-will of the city magistrates, while, on the other hand, the Christian merchants frequently paid bribes to the city magistrates for the exclusion of their Jewish competitors. Thus in 1691, when preparations were being made for the wedding of the crown prince Jacob Sobieski, which was to be attended by many guests, the merchants of Warsaw paid ten silver thalers to the great crown marshal, and gave lemons and oranges to the value of 54 Polish gulden, in order that intercession might be made with the king to withhold protection from the Jews. In the reign of August III., Crown Marshal Francisek Bielinski enforced the restrictive measures against the Jews, and during his incumbency they were permitted to enter Warsaw only during the sessions of the Diet. After his death the old order of things was restored. The great crown marshal Lubomirski issued special certificates at a cost of one silver groschen each, and every Jew wishing to stay in Warsaw was compelled to procure one of them under penalty of imprisonment, although they were good for five days only. The income from these tickets reached the sum of 200,000 Polish gulden annually. Large Jewish colonies were formed in the outskirts of the city on lands owned by members of the Polish nobility. The most noted of these settlements was "New Jerusalem," situated beyond the present Jerusalem gate. Notwithstanding a resolution of the city council which permitted Jews to reside in New Jerusalem, Marshal Lubomirski successively combated the legality of this right of settlement. On Jan. 22, 1775, the marshal's guard invaded New Jerusalem, confiscated the merchandise found there, and demolished all the Jewish houses. The merchandise thus seized, which was valued at hundreds of thousands of gulden, was stored in the arsenal and was later sold at public auction, the proceeds being returned to the Jews. In the following year the Jews secured permission to rebuild their houses, but had meanwhile settled in large numbers in the city itself. On May 25, 1784, however, Marshal Mniszek issued an ordinance expelling the Jews from Warsaw and its environs, though it should be noted that the better classes of Polish society condemned the ill treatment of the Warsaw Jews by the Christian merchant and artisan gilds. This is clear from the following paragraph, for example, in the Warsaw periodical "Pamietnik Historyczo-Politiczny" (1783, p. 5): "What terrible spectacles must we witness in the capital on solemn holidays! Students and even adults in noisy mobs persecute the Jews and sometimes beat them with sticks. We ourselves have seen a gang waylay a Jew, stop his horses, and give him such a cudgeling that he fell from the wagon. How can we look with indifference on such a survival of barbarism?" An agreement was then made with Peter Tepper, the banker of King Stanislaus Augustus, permitting the Jews to reside in Rasin, Tepper's estate in the suburbs of Warsaw. The agreement was profitable to both. Rasin became a Jewish colony, and drew a large volume of trade from Warsaw. The city magistrates were alarmed at the commercial decline, however, and attempted to discourage the growth of the colony by threats and persuasion. They were finally forced to repeal the restrictive ordinances and gave permission to the Jews to reside in special districts. The new Jewish quarter of Warsaw was located on the square known as Marywil, the present theater-square. Subsequently the Pociej Palace was erected there and gave its name to the entire district. The Jews gradually spread to Tlomacka, Klopocka, and Danilowicz streets, while some lived as far as Trinity Church, at the corner of Nalevki and Dluga streets. In March, 1790, members of the furriers' and tailors' gilds convened at the council-hall of StareMiasto, and in their fear of competition requested the magistrates to expel the Jews from the city. They demanded that their request be presented to the Diet, threatening, in case of refusal, to take the matter into their own hands. John Deckert, president of the city council, referred the matter to the Diet, and the latter appointed a commission to investigate the grievances of the Christian gilds. The commission was informed that Jewish competition had forced the petitioners to resolve either to destroy themselves or to annihilate their competitors. The Diet acceded to the demand of the Christian craftsmen and ordered the expulsion of all Jewish traders and craftsmen, allowing only those merchants and manufacturers to remain who kept important establishments. As on former occasions, the Jews who had been expelled gradually returned in the course of a few weeks, and the Christian craftsmen, driven to desperation, organized an anti-Jewish riot. A Christian tailor, Fox, meeting a Jewish tailor on the street, attempted to take from him some clothing which he was carrying. He pursued the Jew, who finally rallied around him some of his coreligionists and had Fox imprisoned, whereupon Fox's workmen raised the cry that the Jews had killed their master. This was the signal for a riot. A mob attacked the Jewish houses and stores, burning and pillaging everything in their way until forced to desist by the troops. The Polish authorities, fearing the outbreak of a revolution like the one which was then raging in Paris, forcibly restored order, arrested Fox and other leaders of the outbreak, enforced the old restrictive regulations against the Jews, and subjected the Jews transgressing these laws to corporal punishment. During the reign of Poniatowski the Jewish question received increased attention among liberal Poles; and at the sessions of the Four Years' Diet some reformers, including Butrymovicz, Czacki, and Kollontai, presented projects for its settlement. The occupation of Warsaw by the Prussians brought about a beneficial change in the position of the Jews. The Prussian government, not recognizing the old city charters, allowed them to live in Warsaw, permitted them to organize a ḳahal for the regulation of local Jewish affairs, abolished rabbinical tribunals, and prohibited rabbinical anathemas under penalty of fifty thalers' fine and banishment for rabbis guilty of repeating this offense. The new administration led to an influx of Jews to Warsaw, thus giving rise to renewed complaints from the Christian merchants. 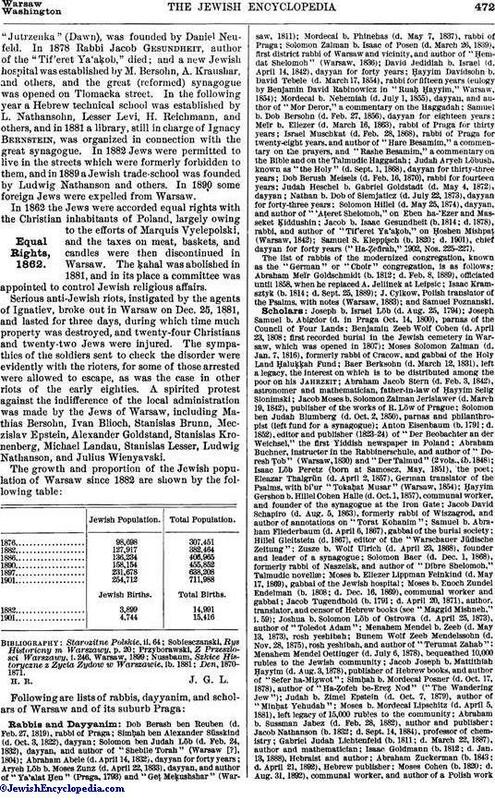 A census of the Jewish population, ordered by the Prussian authorities in 1793, was largely evaded by the Jews, and the census returns of 6,997 were evidently much below the actual figures. When the Russians invaded Poland in 1794 the Jews did their share in defending their Polish fatherland. Joselovich Berek formed a light horse regiment of 500 Jews of Warsaw, which was almost annihilated during the siege of Praga (a suburb of Warsaw) by Suvarov. Among the wealthy Jewish merchants of Warsaw at the end of the eighteenth century may be mentioned Hershka and Itzik, David and Nutka of Karolevetz, Hershko Markevich, Iosek and Hershko Salamonovich of Posen, Ivosan and Ḥayyim of Lutsk, Naftal of Sokhachov, Shmul Scheidazh and Abraham of Cracow, Josel Jankel and Schmul of Piotrkow. One of the most prominent Jews of the time was Samuel Zbitkover, who was also called Schmul Jacobovich. His name figures largely in official documents and in the correspondence of King Stanislaus Augustus, whose favorite he was; and a quarter of the suburb Praga was even called Schmulevizna in his honor. During the first partition of Poland he was the chief contractor in the Russian army, and traveled with an honorary convoy of Cossacks by permission of General Romanus. Zbitkover was evidently a very influential man, and Stanislaus Augustus, in a memoir which he presented to Catherine II., mentions 7,000 ducats which the Russian army owed the contractor. The king also presented him with some lots in the suburb of Praga for a Jewish cemetery and synagogue. After the second partition of Poland, Zbitkover still continued to be the contractor of the Russian army, but after the Polish uprising under Kosciusko in April, 1794, the Polish party ("Rada Zastepeza") confiscated his money, which amounted to 757 ducats, and his leather factory. On Nov. 4, 1794, during the siege of Praga, Zbitkover, in his sympathy for the many victims of the war, issued a notice that any soldier or citizen who should bring him an inhabitant of Praga, whether Jew or Christian, would receive a ducat in gold, and whoever should bring him a dead citizen of Praga for burial, would be paid a ruble in silver. Two barrels, one filled with gold and the other with silver, stood before him, and both were emptied in a day. He died Sept. 3, 1800. In 1797 an order was issued directing all the Jews of Warsaw to adopt family names selected by themselves or assigned them by local officials, and this ordinance accounts for the frequency of German names among the Polish Jews. The increase of the Jewish population led the Prussian authorities to check the influx of Jews into Warsaw, and in March, 1798, a certain portion of the Jewish population was expelled from the city, and the remainder had to submit to increased taxation. All Jews who should arrive in Warsaw after that date were to pay a poll-tax of one gulden daily, while the "Nahrungssteuer," or tax collected from the permanent Jewish population, amounted to 210,000 Polish gulden annually. In addition to this, the Jews were obliged to pay a "Toleranzsteuer" amounting to 50 per cent of the total tax collected from the city population. Two years later the tax on kasher meat was again levied by the government, and in March, 1809, this tax, which formerly amounted to two groschen per pound, was raised to six groschen. The burdensome taxes did not, however, check the increase of the Jewish population. In May, 1804, another anti-Jewish riot broke out in Senatorski street, but was quelled by troops. In 1826 a rabbinical school was established inWarsaw under the direction of Anton Eisenbaum, some of the chief teachers being Aaron Moses Cylkow, father of the Judæo-Polish preacher of Warsaw, Jacob Cylkow (who translated the Psalms into Polish; Warsaw, 1883), A. Buchner (author of "Der Talmud und Seine Nichtigkeit"), and Isaac Kramsztyk. Eisenbaum, who was born at Warsaw in 1791 and died there in 1852, was educated under the supervision of his father, who instructed him in the Bible and Hebrew grammar in addition to his Talmudic studies. 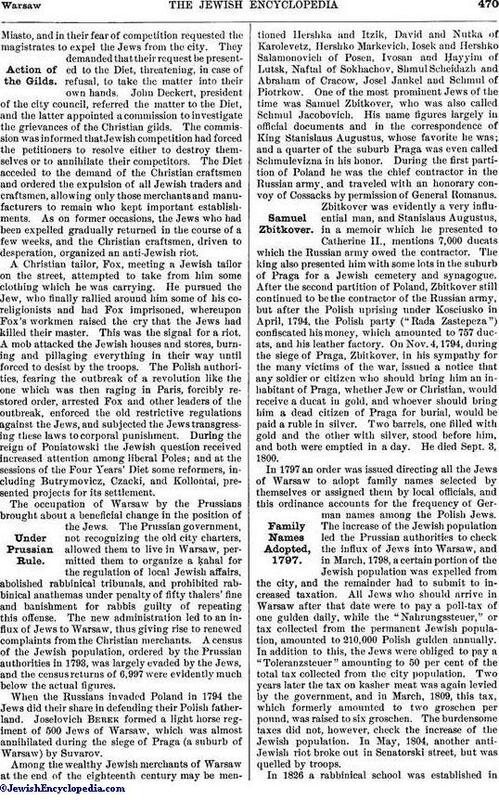 In the latter part of 1823 he founded a Jewish weekly in Yiddish and Polish with the title "Der Beobachter an der Weichsel" (Polish title, "Dostrzegacz Nadwisianski"). A copy—the only one in existence—of this, the first Judæo-Polish periodical, is preserved in the library of the great synagogue of Warsaw. The school, however, did not produce many rabbis, since its real object was to impart secular knowledge rather than rabbinical learning, and it gradually became a Jewish high school ("Keneset Yisrael," i. 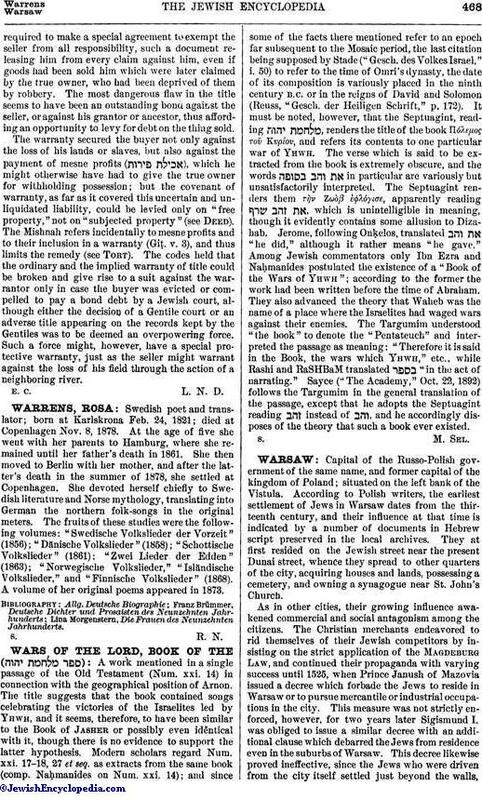 138; Reifmann, "Mo'ade 'Ereb," p. 84, Wilna, 1863; see also "Allgemeine Zeitung des Judenthums," 1851, No. 43). 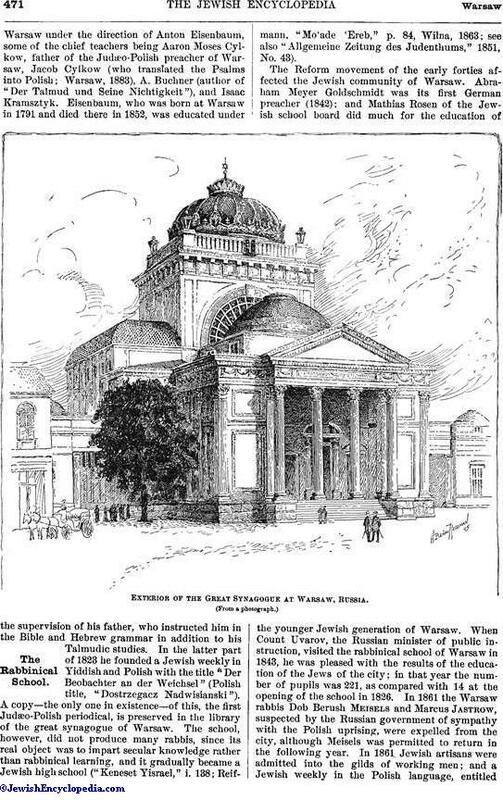 Exterior of the Great Synagogue at Warsaw, Russia. The Reform movement of the early forties affected the Jewish community of Warsaw. Abraham Meyer Goldschmidt was its first German preacher (1842); and Mathias Rosen of the Jewish school board did much for the education of the younger Jewish generation of Warsaw. When Count Uvarov, the Russian minister of public instruction, visited the rabbinical school of Warsaw in 1843, he was pleased with the results of the education of the Jews of the city; in that year the number of pupils was 221, as compared with 14 at the opening of the school in 1826. In 1861 the Warsaw rabbis Dob Berush Meisels and Marcus Jastrow, suspected by the Russian government of sympathy with the Polish uprising, were expelled from the city, although Meisels was permitted to return in the following year. 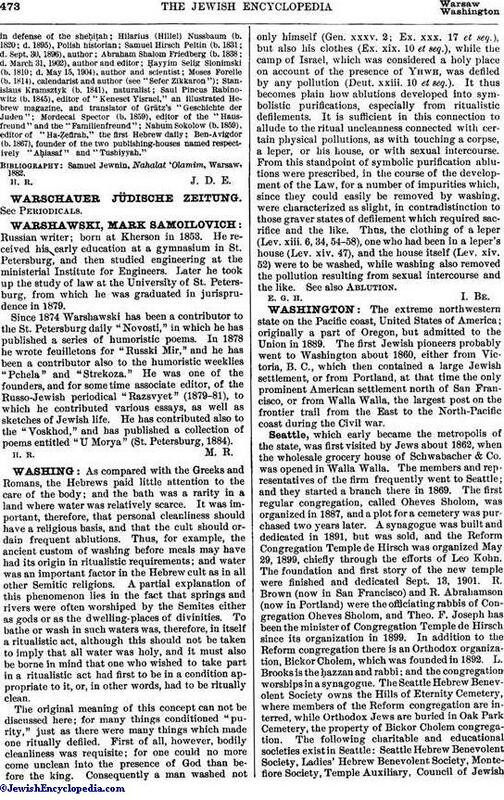 In 1861 Jewish artisans were admitted into the gilds of working men; and a Jewish weekly in the Polish language, entitled"Jutrzenka" (Dawn), was founded by Daniel Neufeld. In 1878 Rabbi Jacob Gesundheit, author of the "Tif'eret Ya'aḳob," died; and a new Jewish hospital was established by M. Bersohn, A. Kraushar, and others, and the great (reformed) synagogue was opened on Tlomacka street. 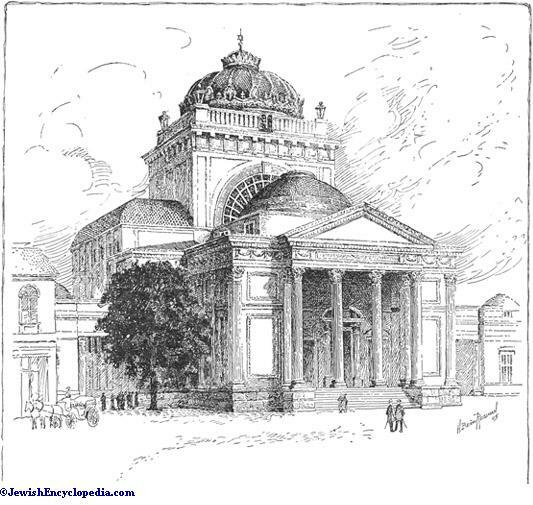 In the following year a Hebrew technical school was established by L. Nathansohn, Lesser Levi, H. Reichmann, and others, and in 1881 a library, still in charge of Ignacy Bernstein, was organized in connection with the great synagogue. In 1882 Jews were permitted to live in the streets which were formerly forbidden to them, and in 1889 a Jewish trade-school was founded by Ludwig Nathanson and others. In 1890 some foreign Jews were expelled from Warsaw. In 1862 the Jews were accorded equal rights with the Christian inhabitants of Poland, largely owing to the efforts of Marquis Vyelepolski, and the taxes on meat, baskets, and candles were then discontinued in Warsaw. The ḳahal was abolished in 1881, and in its place a committee was appointed to control Jewish religious affairs. Serious anti-Jewish riots, instigated by the agents of Ignatiev, broke out in Warsaw on Dec. 25, 1881, and lasted for three days, during which time much property was destroyed, and twenty-four Christians and twenty-two Jews were injured. The sympathies of the soldiers sent to check the disorder were evidently with the rioters, for some of those arrested were allowed to escape, as was the case in other riots of the early eighties. A spirited protest against the indifference of the local administration was made by the Jews of Warsaw, including Mathias Bersohn, Ivan Blioch, Stanislas Brunn, Meczislav Epstein, Alexander Goldstand, Stanislas Kronenberg, Michael Landau, Stanislas Lesser, Ludwig Nathanson, and Julius Wienyavski. Samuel S. Kleppisch (b. 1820; d. 1901), chief dayyan for forty years ("Ha-Ẓefirah," 1902, Nos. 225-227). Ben-Avigdor (b. 1867), founder of the two publishing-houses named respectively "Aḥiasaf" and "Tushiyyah." Samuel Jewnin, Nahalat 'Olamim, Warsaw, 1882.